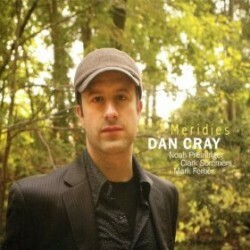 Pianist Dan Cray’s latest CD is Meridies (Origin, 2012). In this interview, Cray talks about moving to New York City at a later stage in his career than most people do; why he decided to focus on his own compositions on this album; the influence of his teachers on his musical career; and how he leaves room for surprise in the studio and on stage. Learn more at dancray.com and follow his on Twitter at @DanCrayJazz.